The Hotel Altica is located in the town of La Teste De Buch, Arcachon. It is just a 15-minute drive from The Great Dune of Pyla. Guests can enjoy a breakfast buffet, which is served daily. 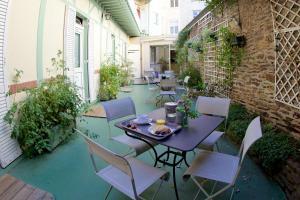 All Suites Appart Hôtel La Teste price per day from € 57 . Peaceful house, close to the beach price per day from £ 116 . Quality Suites Et Spa Arcachon price per day from € 89 Located in the La Teste de Buch Business Park, this residence is 5 km from the seaside town of Arcachon. Each has a private balcony, an iPod docking station and a kitchenette area. With one of the largest spas in the region, a hammam, hot tub and massages are offered on site. Ibis Arcachon la Teste de Buch price per day from € 79 Set in a pine forest, 5 km from the sandy beaches, ibis Arcachon la Teste de Buch is an air-conditioned hotel with 24-hour reception. It includes a heated outdoor swimming pool and a grill restaurant. Grocers and other restaurants can be found right next to the building..
Town of La Hume (~2.7 km). 9+ accommodation units ! Town of Arcachon (~4.1 km). 85+ apartments, 66+ villas ! Town of Le Moulleau (~5 km). 66+ accommodation units ! Town of Gujan-mestras (~5.9 km). 17+ villas/holiday houses ! Town of Le Teich (~9.4 km). 10+ accommodation units !